Reviews is a series of four exhibitions which re-situate some of the last 20 years in the Toronto art scene. Reviewing not only individual works but also the critical context in which the work was produced, this series attempts to expand upon ideas of local art history. This second exhibition in the series focuses on key exhibitions from the early to mid 1980’s which assembled the intense collective activity of the burgeoning Toronto arts community. Through the exhibitions YYZ Monumenta, Chromaliving and The New City of Sculpture, attempts were made to forge a sense of a shared formal language; a vital language of imagery and representation which not only abandoned a “modernist” approach to art, but also became the base for a communal structure. 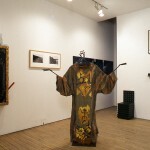 It was called the new representation: in the early eighties, large groups of Toronto artists banded together in the context of artist-run centres with the intent of developing a local vernacular of art practice that would set itself apart from not only New York, but also from the experimental formalism of Toronto’s recent past. In 1982, David Clarkson, Stan Denniston and Bernie Miller (then Board members of YYZ) organized YYZ Monumenta, a massive, multi-gallery exhibition that featured 75 artists at A Space, ChromoZone, Gallery 76 and YYZ. “It’s representation in the broadest sense,” Stan Denniston said in an interview with Globe & Mail critic John Bentley Mays, “The old Toronto experimental formalism is passing away at last.”2 The following year, Chromaliving, an exhibition of painting, sculpture, fashion, and furniture, opened in a renovated 10,000 square foot space at the old Harridge’s department store. Organized by ChromaZone, a collective of artists from 1979-83 that included Andy Fabo, Rae Johnson, Oliver Girling, Tony Wilson, Sybil Goldstein, Hans Peter Marti, the exhibition continued for a mere 3 1/2 weeks but attracted about 8,000 visitors. 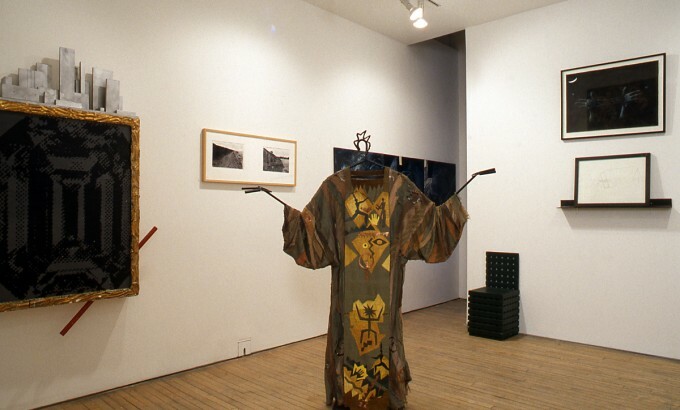 The New City of Sculpture,, curated by David Clarkson and Robert Weins, opened in August 1984, exhibiting new work by 33 Toronto sculptors at A.R.C., Gallery 76, Grünwald Gallery, Mercer Union, Studio 620 and YYZ. All three exhibitions were attempts to forge a sense of an artistic community with a shared formal language. It was a politics of community that was more about communal structure than critical content. The turning away from the more politically engaged work of the recent past would become, for many critics, only a cynical, postmodern recycling of images from the warehouse of art history for a hungry Reagan/Mulroney art market. But of course such a critique depended upon ignoring the difference between the free market entrepreneurial condition of the New York art world and the predominantly government-funded, artist-run culture of Toronto. Inasmuch as these exhibitions wanted to celebrate and promote a new and young generation of artists who had come of age during the period of expanded funding and artist administered culture, and inasmuch as they wanted to localize the practice and theory of art, comparisons with Neo-expressionism, the New York art market and contemporary European art were hard to miss. That point was not lost, however, on many artists who realized the parodic relationship of their work to this larger context. More often than not, it became a subject of their work. David Buchan’s photographic work played with ideas of commerce and art; a 1984 white on green chalkboard drawing by Brian Scott depicts a simple transaction: credit card for shoes. Bruce Grenville’s allegory might come in handy here, but not as a critique of Western metaphysics. Could it instead be Van Gogh’s famous shoes…the continually impoverished state of culture…the over-leveraged, credit-addicted eighties? 1. Christopher Hume, “Group Show Torpedoes the Good Ship Abstract,” The Toronto Star, September 4, 1982, p. 11. 2. Quoted in John Bentley Mays, “Drawing Notice to New Art,” The Globe & Mail, September 3, 1982, p. 15. 3. Stan Denniston quoted in Christopher Hume, op. cit., p. 10. 4. John Bentley Mays, “The Wobbles are Out and Recognition Returns,” The Globe & Mail, September 25, 1982, p. 13. 5. Andy Fabo, “Chromaliving…The Facts…,” Chromaliving exhibition catalogue 1983, p. 2.